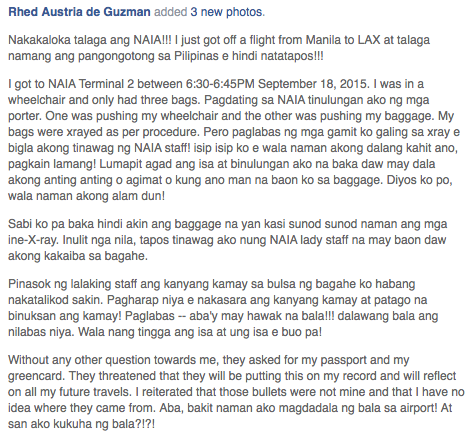 Rhed Austria de Guzman posted on Facebook about her experience in NAIA while she was flying out to Los Angeles, September 18. Arriving in NAIA in a wheelchair with 3 baggages, she states that while her bag was going through x-ray, she was alarmed by NAIA staff that there was something strange in her baggage. She recalled that she did not bring anything other than food. Next, the staff examined her baggage with their backs facing her, and showed her that there was a BULLET that allegedly came from her bag in which she denied “Why would I bring a bullet to the airport? And where would I get a bullet in the first place?.” She was terrified as she thought she would not make her flight back to LA and having this incident to her records would be horrifying. She was terrified and infuriated with the experience as for Php 500.00 they were willing to ruin someone’s records. What do you think of this? What would you have done if you were in her place?